A) NSTSE Topper is awarded Rs. 2,00,000 cash prize*. The student who achieves the highest percentage of marks among all the classes is declared as NSTSE Topper. C) The next 22 rankers in each class (Ranks 4 to 25) of each class are awarded a cash prize of Rs. 1000 each. D) Rankers 26 to 100 of each class are awarded BMA’s Talent & Olympiad Exams Resource Book from M/s. Brain Mapping Academy, each. Bangalore, Bareilly, Bhubaneswar+Cuttack, Chandigarh+Mohali+Panchkula, Chennai, Faridabad+ Gurgaon, Hyderabad, Indore, Jalandhar, Jaipur, Kolkata, Kanpur, Kota, Lucknow, Mumbai, Nagpur, Nasik, Noida+Ghaziabad, Pune, Varanasi, Yamuna nagar+Karnal+Ambala+Kurukshetra, Vadodara and Visakhapatnam. Note: City-wise topper is declared after the 100 ranks across the country and state toppers. City Rank (for every Class) is declared for classes having a minimum of 500 students in a particular city. 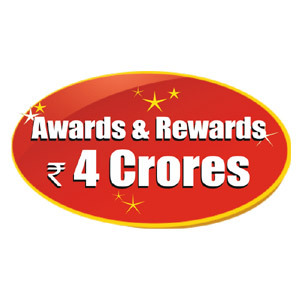 All National, State & City Rankers of Classes 1 to 9 will each be awarded a voucher worth Rs. 400 from www.mapmySTEP.com – India’s first scientifically designed portal for Olympiad & Talent exams preparation.